This blog is to communicate the University of Kent's work to develop and support copyright literacy throughout the institution. Last Friday 21st July I held the first Kent copyright community of practice (CoP) since the end of term party at the end of last year. It was a chance to bring people together again as the first half of the year had proven to be very busy, particularly juggling the needs of the day job with external study. However I am very pleased to say that I have now passed my PGDip in copyright law and am looking once again to involve Kent colleagues in the process of raising awareness of copyright issues throughout the University and promoting best practice. Friday’s meeting was a really great opportunity to welcome some new faces to the group as well as some of the regulars. We had great representation from various teams including Library Collections, Academic Liaison Services, the Office for Scholarly Communications and the Drill Hall Library and we talked about what we wanted to consider at future CoP meetings. The conversation ranged across a number of different areas, but a key area for development was how to communicate best practice in education particularly in light of the discussion that I was involved in at a recent UUK / GuildHE copyright workshop and the University’s plans for extending the use of the KentPlayer lecture recording service. 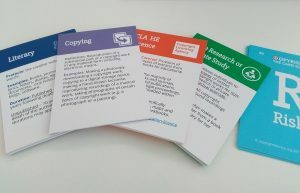 I also got the chance to show of the newly designed copyright card game cards and get in a plug for the next session at Kent on 4 August. Please send an email to copyright@kent.ac.uk if you’re interested in coming. My plans over the coming months are to draw up a plan for embedding copyright literacy throughout the University and it seems as if the CoP will be an extremely important component of this. Those who couldn’t make this meeting were missed, but there will be plenty more opportunities to discuss copyright matters and I’m hoping to get some interesting external guests to come and talk to us as well (this may be part of our LibChats or TechTalks programmes). And finally, this time we had double chocolate mini rolls and chocolate coated rice crispy cakes. The rice crispy cakes were the most popular.